The Perry-Castaneda Library turns 40 years old. For the Perry-Castaneda Library, or “PCL,” the authors number in the millions. And this month, the PCL celebrates its fortieth anniversary as UT’s first open-stack main library. The Perry-Castaneda Library is the fourth main library on the campus. The first was in the old Main Building (photo at left), poorly placed on the first floor of the north wing, where it was just below a two-story, 1,500 seat auditorium. When the auditorium was being used for a concert, play, or football rally, studying in the library was difficult at best. It was better used during quieter times, though men and women were required to sit at separate tables. By the 1930s, Battle Hall was overcrowded, and Old Main was razed to make room for a new Main Building that served as the central library. Grand reading rooms were installed on the lower levels, while the book stacks were housed in a 27-story Tower. 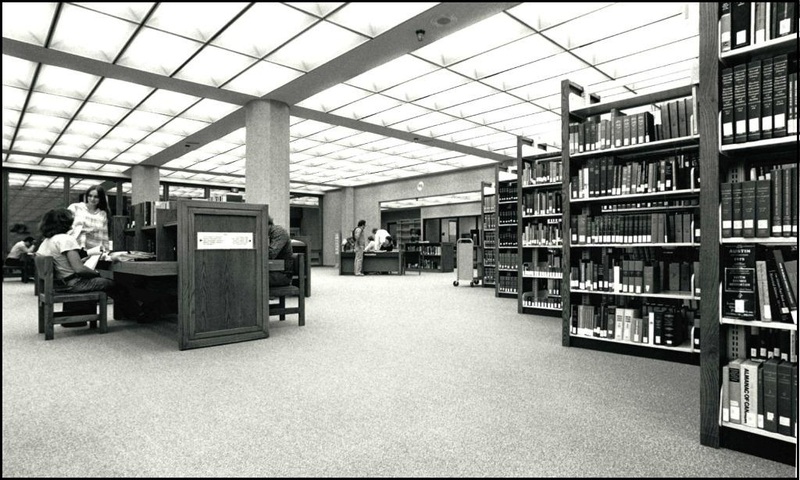 Some relief was achieved in 1963 with the opening of the Undergraduate Library and Academic Center, today known as the Flawn Academic Center, where students had direct access to some books helpful for UT undergraduate courses. But the bulk of the library was still in the Tower, and the grumbling of long lines and slow service grew to a full-throated yell by 1970. 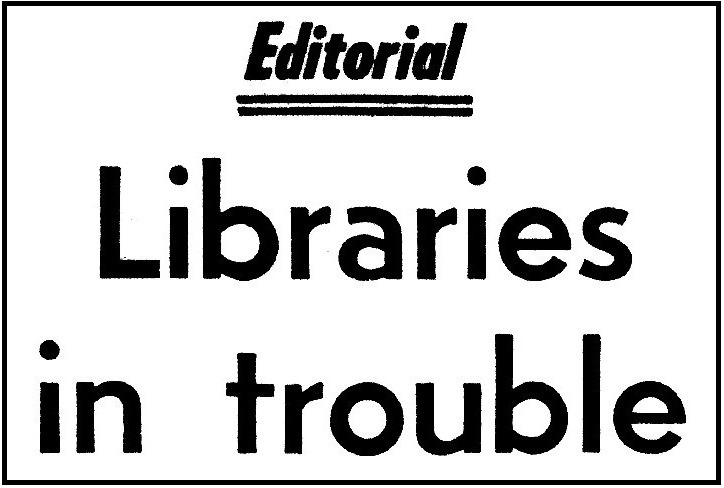 “When I stand at the desk of the Main Library and have to wait 25 minutes for one book,” wrote Sue deNim in a 1971 op-ed for The Daily Texan, “when I am told that I can borrow only two or three books, when I am told that, although the catalogue doesn’t list a book, it is somewhere in the half-a-year list of books to be processed: on all of these occasions I am being deprived of needed resource material. No one is doing it deliberately, but it is being done. With complaints mounting from both students and faculty, University President Bryce Jordan appointed a library planning committee, and by April 1972, the Board of Regents approved the committee’s recommendation of a new facility. 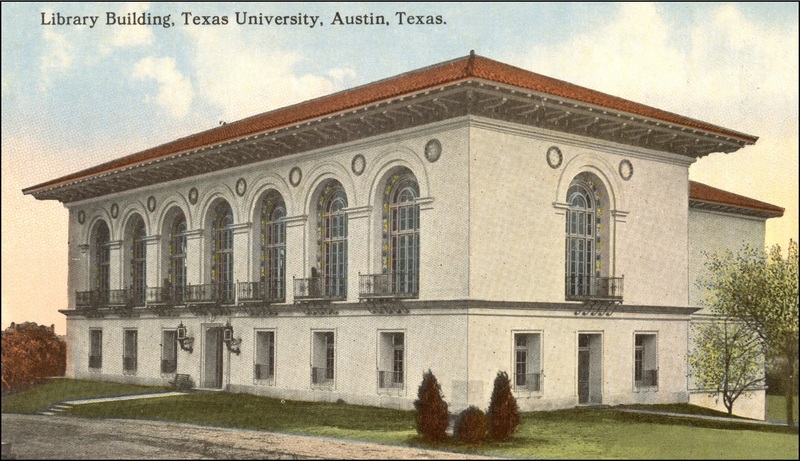 The building was to serve three functions: to house the humanities and social science collections, along with business, education, and psychology; provide additional reader and study areas for campus users; and be the centralized acquisition and processing facility for all UT libraries. Head Librarian Fred Folmer was assigned the herculean task of overseeing the project, while Associate Head Librarian Harold Billings stepped up to run the current library’s daily operations. Six possible sites were studied, including the northeast corner of 26th Street, two locations along Speedway now occupied by the newer portion of Welch Hall and the Gates-Dell Computer Science Complex, the position of today’s Student Activity Center, a parking lot at the southwest corner of 21st Street and Speedway, and Clark Field. Suitability was based on the proximity to central campus, enough space for 100,000 square foot floors, potential for future expansion, and minimal destruction of existing buildings. 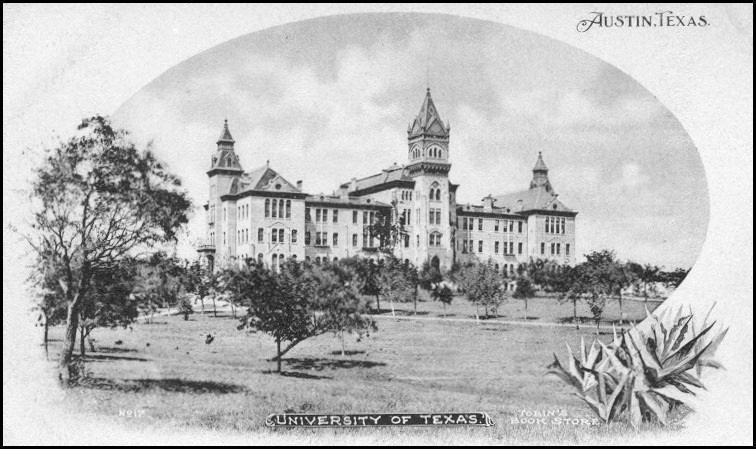 Clark Field was ruled out early as being too far out of the way, and as part of the field would remain for football and Longhorn Band practice – which would likely disturb library users – the UT administration was anxious not to repeat the mistake of the library location in Old Main. In the end, the southwest corner of 21st and Speedway seemed best. The recently completed Jester Center Residence Hall to the east, a new Graduate School of Business Building across the street to the north, and a planned Education Building (today’s Sanchez Building) to the south, along with the proximity of the business school and Gregory Gym, meant the area would be a high traffic zone for students. There was ample room for five, expansive, 100,000 square foot floors, which Board of Regents chair Frank Erwin bragged was “bigger than five K-Marts,” and space to the west of the proposed library was reserved for expansion. The San Antonio architecture firm Bartlett Cocke and Associates, Inc. was appointed to design the building. 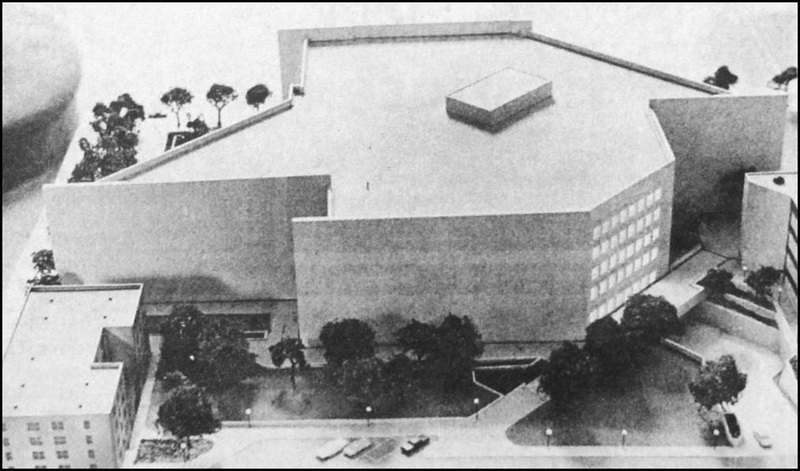 Though a campus myth persists that the library’s shape is an abstract form of the state of Texas, the building was actually planned to ease pedestrian traffic around it. Instead of a traditional square or rectangular footprint, corners were trimmed to allow for diagonal pathways in front of and behind the building. Other parts were extended to make the best use of available area. 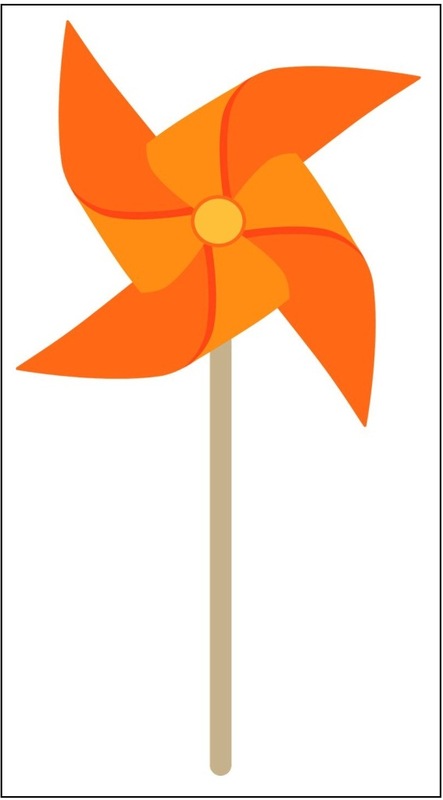 The end result was actually meant to better resemble a pinwheel, not the Lone Star State. The Board of Regents approved the plans in March 1974, along with $17 million for construction. Above: An architectural model of the PCL, illuminated from within. The diagonal shape allowed pedestrian traffic around the building to flow easier, and provided room for a plaza in front of the main entry. 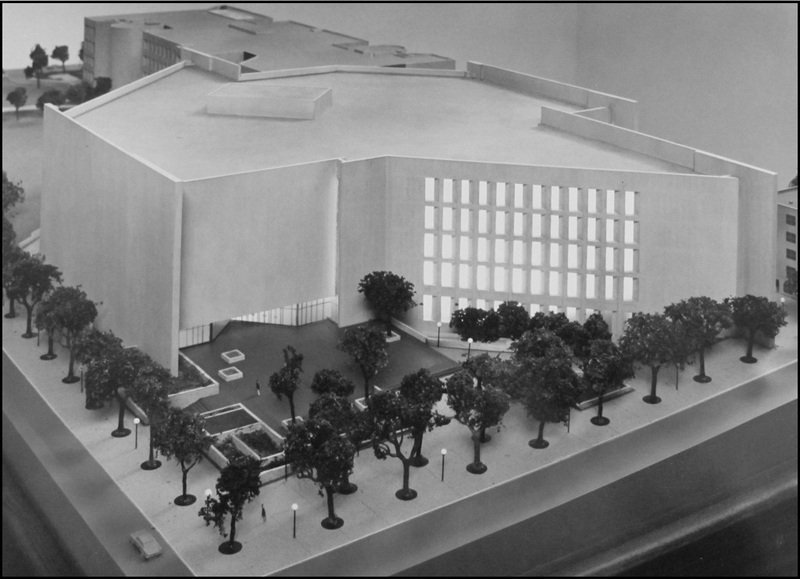 Above: The west side of the PCL architectural model. The corner in the lower right has been trimmed to provide a shorter pathway between the PCL and the Education Building (now the Sanchez Building) just to the right. The footprint of the library is a bit like a distorted pinwheel. 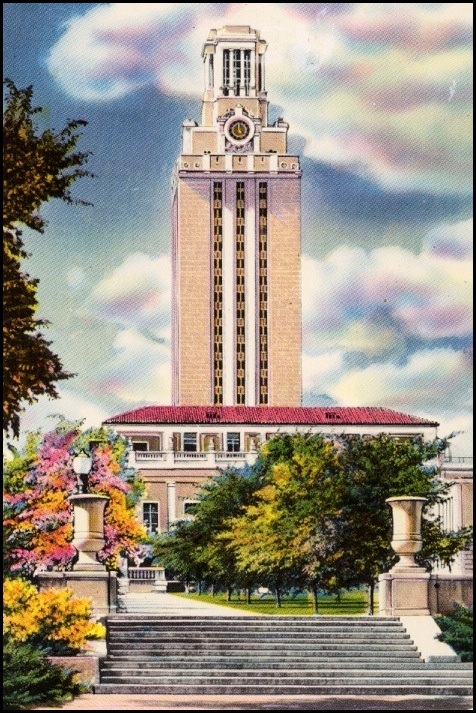 Through initial discussions between President Stephen Spurr and the UT System, and continued by Spurr’s successor, President Lorene Rogers, all agreed that naming the library was an opportunity to “express the University’s lasting commitment to educational opportunities for all Texans.” In 1975, Rogers formally asked the Board of Regents to name the building in honor of Ervin Perry, the first African American to be promoted to the academic rank of professor on the Forty Acres. 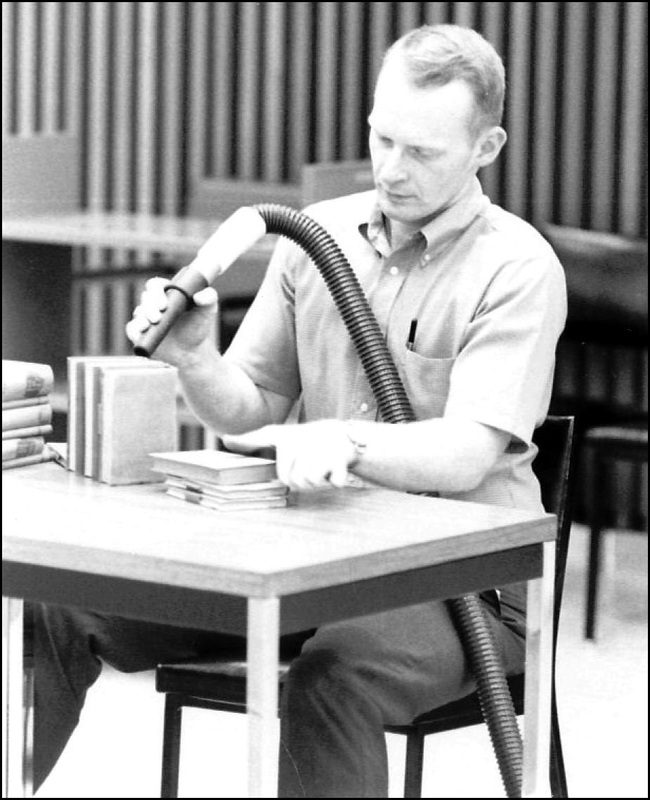 Perry had earned masters and doctorate degrees in civil engineering at the University and had served as chair of the department before his untimely death in 1970. Along with Perry, Rogers also requested the library be named for Carlos Castaneda. Having earned three degrees at UT, Castaneda began his career as the Latin American librarian in 1927, then rose through the academic ranks to be a famed professor of Latin American and Texas history, and author of a dozen books. The regents nuanimously approved the idea at their September 12th meeting, and the facility was officially called the Perry-Castaneda Library. 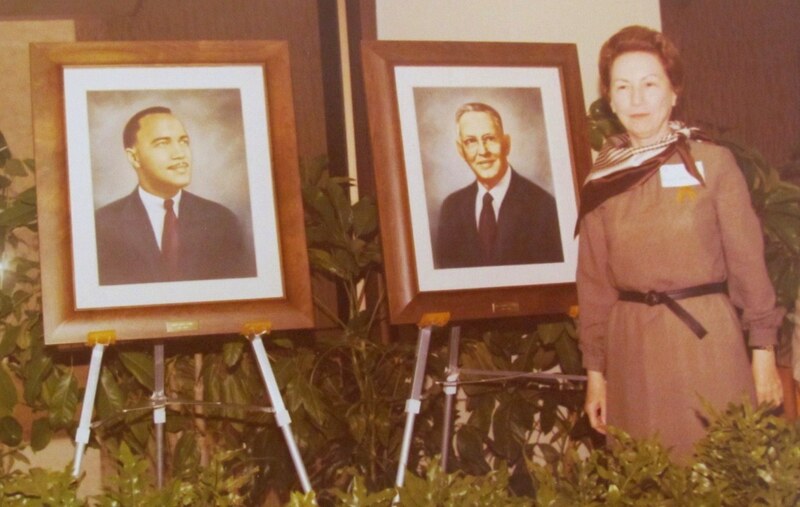 Above: At the dedication ceremony, UT President Lorene Rogers unveiled portraits of Dr. Ervin Perry (left) and Dr. Carlos Castaneda, for whom the library is named. Above: The library under construction early in 1976, as viewed from the Tower. 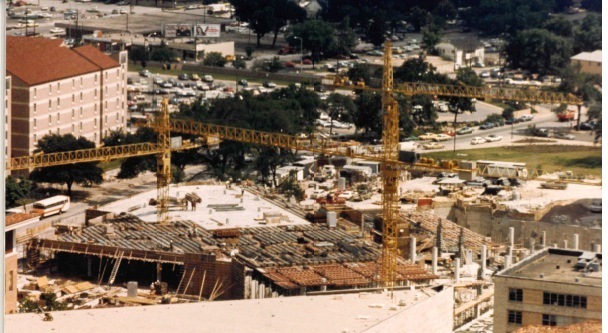 Construction of the PCL began in the summer of 1974 and required three full years. Over nine acres of carpeting were installed. Because the twelve-foot long, eight hundred pound rolls of carpet were too heavy for the elevators, a temporary hoist was mounted in the south stairwell and the rolls pulled up to each floor. Set on top of the carpet were seventy miles of shelves, about a third of which would initially be unused. When opened, the library would have two million volumes, but was designed to accommodate three-and-a-quarter million. By late spring of 1977, the building was nearing completion, and it was time to move both books and the card catalog. The process was long and tedious. Each of the million-and-a-half books from the Main Building needed to be inspected, cleaned with a special vacuum (left), and placed on book mover dollies for transport. Damaged volumes were set aside for repair. 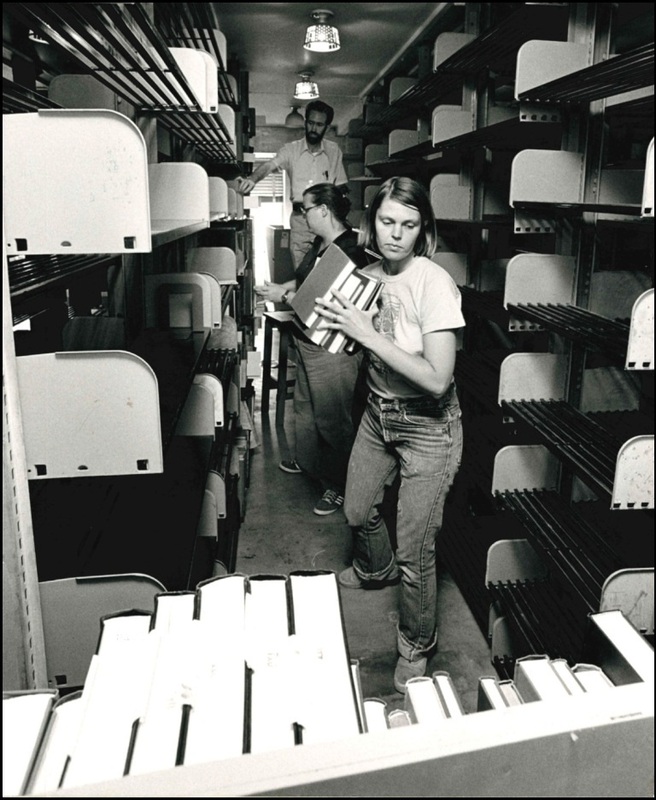 The dollies were then loaded on to trucks and driven to the PCL loading dock where the books were re-cataloged, placed on the service elevator, and re-shelved on the appropriate floors. At the height of summer, crews worked six days a week to transport more than 7,200 dolly loads of books across the campus. The humanities and social science collections came from the Main Building, the business library from the Business-Economics Building (which opened space for a growing business school), and the education and psychology collections from Battle Hall, which would be transformed into today’s architecture and planning library. With classes in session through the summer, the library still had to be operational. Requests from students who needed books that had already been moved were accommodated within a day. The Perry-Castaneda Library opened August 29, 1977 to rave reviews. “This magnificent structure is one of the largest and finest academic library buildings in North America,” President Rogers boasted at the dedication ceremonies. Regent (and future Texas governor) Allan Shivers called it “a warm and inviting place.” Its walls were built from textured Indiana limestone, and its large windows purposely inlaid to be well-shaded from the hot Texas sun. The live oak trees desired for landscaping were too large to be found at a traditional nursery, and were instead purchased and transplanted from ranches around Austin. Inside was the University’s first open-stack main library, with seating for 3,200 patrons. 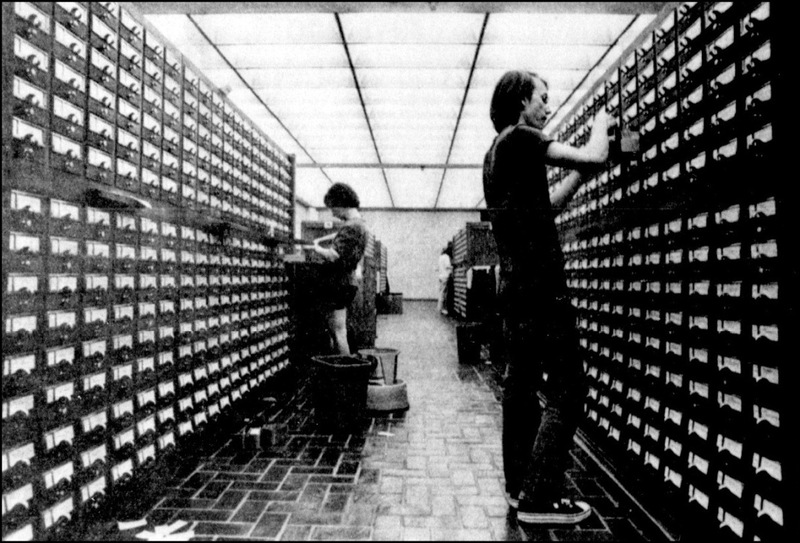 Students still had to search through a card catalog (above left) – an online version wouldn’t be available until 1990 – and the low tech security at the entrance required the physical inspection of backpacks. Before the campus became smoke-free, designated smoking rooms were available on each floor. Above: With more than nine acres of carpeting and seventy miles of shelves, the PCL provided spacious accommodations for a growing University. 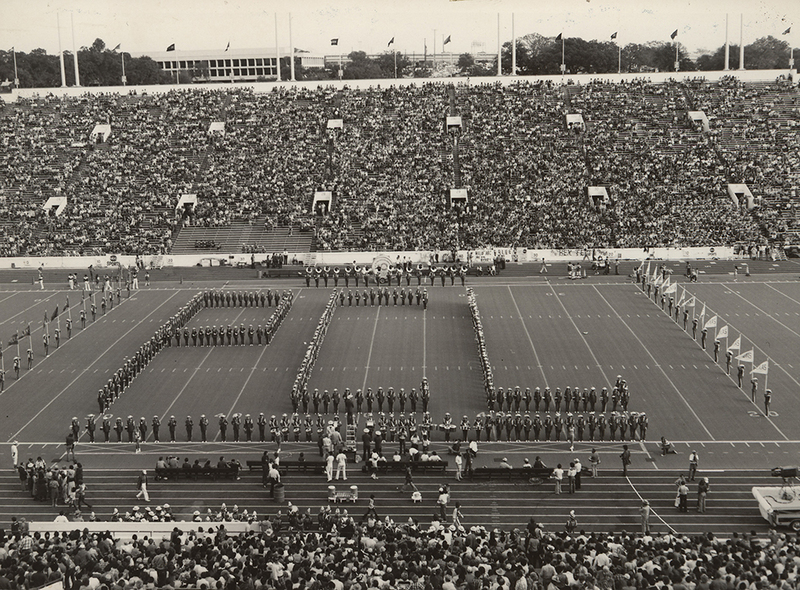 Above: As part of the dedication ceremonies, the Longhorn Band spelled “PCL” at halftime of the Texas vs. Baylor game. Special thanks to Travis Willmann and use of the PCL archives. Very informative article, Jim. Thank you! Great article, Jim. I learned many new facts about the old work place. Great article! 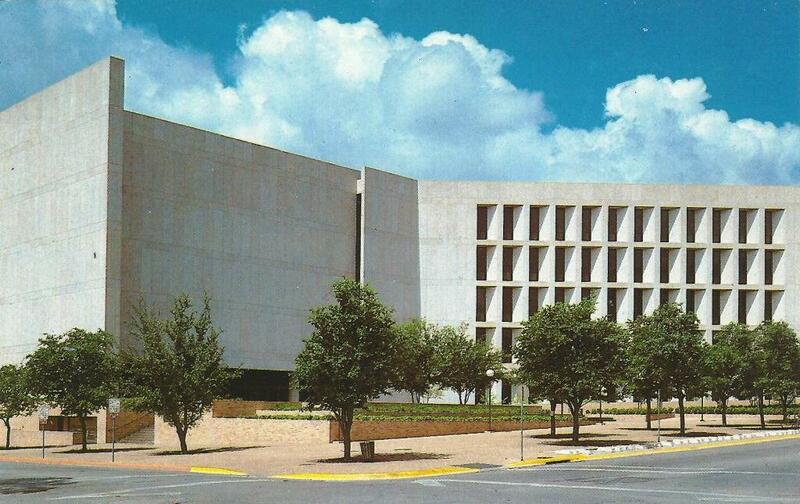 I always wished they would carve a giant UT-Austin Seal into the face of the PCL over the entrance….